When you think cheek stain, do you think powder? I don't. That's why LORAC's new PRO Powder Cheek Stain ($20) caught my eye online at Sephora. As a fan of Carol Shaw's makeup, I added Petal Pink to my cart faster than I could blink. An innovative, 12-hour long-wear powder blush stain infused with skin-nourishing nutrients. Get an instant flush of long-lasting, natural-looking color with LORAC’S PRO Powder Cheek Stain. Created by celebrity makeup artist Carol Shaw, this innovative blush stains your cheeks with one swipe of healthy, radiant color. This formula is infused with antioxidants of vitamins A, C, E; pomegranate; green tea; white tea; grape seed extracts; and aloe to help nourish and protect, while hyaluronic acid helps to keep skin hydrated. This fragrance-free and paraben-free powder stain is easy-to-use and applies super-smoothly and evenly for color that lasts. Packaged in a sleek, "camera lens component," cheek stains are "perfect for the pro on the go." I like it! Because is has no embedded sparkles, it doesn't shimmer on the face. I know many of you prefer sparkle-free blush for a natural look, and PRO Powder Cheek Stain delivers. The texture is superb. The powders are extremely finely milled. If you run your finger across the color, you'll swear it's a cream or cream-to-powder blush. The color I selected, Petal Pink, is perfect for my fair skin. There are four other shades - all tempting - so I'm sure there's one for everyone. I'm tempted to try Rosy Glow or Plum Passion (with a light hand). My photos were taken in late afternoon with light that was compromised by high clouds. Still, I think I was able to represent the color accurately. I applied Petal Pink very heavily with a sponge-tipped applicator. From my two photos - one darker than the other - you should be able to see that Petal Pink is the perfect choice for fair-skinned beauties. The selling feature of PRO Powder Cheek Stain is its long wear. I've tested it for a few days, and I'm impressed by its longevity. I'm not sure whether I get more pale as the day passes, or whether my makeup is wearing off. If I look for my makeup, I can see it, but the general effect in a mirror (yes, one of those dreadful ladies room mirrors with bad lighting) is pale. Petal Pink has given me a few extra hours of "pretty in pink." Can't beat that, especially for $20. You should know that Carol Shaw says a little of this blush goes a long way. I didn't experience that with Petal Pink - I apply my usual amount with a fluffy brush - but I can see that you might want to use a light hand with the other shades. I purchased mine during one of my many browsing expeditions at Sephora. 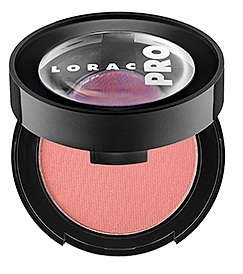 You can also find PRO Powder Cheek Stain at the LORAC Web site. Please let me know what you think. Isn't this a unique product! I've always associated cheek stains with cream and liquid/gel products. Is this the first powder cheek stain you've encountered? Yes it is. I'm not sure I can call it a stain, in the true sense of the definition, but it's nicely long-lasting.